Galaxy and see what's got him so blue? Rumor has it you'll get a chance to capture one of the new Mogas in the wild if you complete Fredric's quests! Note that this event is only available this month of February 2012! Grab your chance now! - Go to Cydonia Castle. - Go to Heavenly Greens Gate. - Re-enter Heavenly Greens Gate and fight Jezabelle's Mogas. - Re-enter Northside and fight Jezabelle's Mogas. - Go to Spiral Cave and enter Daydask. - Re-enter Daydask and fight Jezabelle's Mogas. - Go back to Cydonia Castle and defeat the Black Katanas. - Find and Capture Chidi. 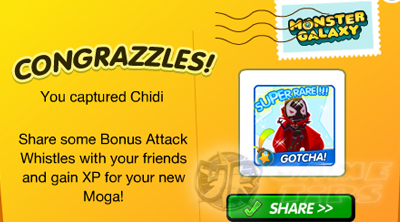 - Chidi is a Super Rare Moga with 19% maximum capture rate. - Location: Can be captured randomly anywhere! Katanas" Mogas can be won in the Sky Shop: Super Spin and chance item (cash). Good Luck!